Congressional opposition to the recently announced nuclear accord with Iran reached a critical tipping point this week as lawmakers from both sides of the aisle publicly lambasted the deal while pushing for tighter economic sanctions on Tehran. As the details of an interim nuclear deal reached last month in Geneva become clear, Congressional opposition has grown, leaving the White House to sell a deal that even its allies have dubbed as worrisome. The White House held a classified briefing with members of Congress on Wednesday to push them against passing new sanctions in 2014, giving Iran at least another year of economic reprieve, according to Rep. Brad Sherman (D., Calif.). "They want to convince us not to take any action in the first five or six months of 2014," Sherman said on the House floor during a Special Order on Iran organized Wednesday evening by Rep. Peter Roskam (R., Ill.). "That means, in effect, we are not going to take action in 2014." "Let’s take a look at this deal and we’ll see what we get out of it is at least overstated by its proponents," Sherman said, explaining that the deal does not actually halt Iran’s contested uranium enrichment program, as the administration has claimed. "They will be making very substantial progress toward their eighth, ninth, tenth bomb" as the deal is carried out, Sherman said. "This agreement provides that Iran makes substantial progress towards more low-enriched uranium, building its stockpile toward a real collection of nuclear bombs." 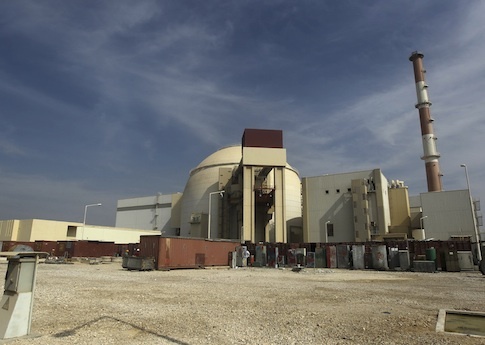 Iran is required under the interim deal to halt some of its nuclear activities for six months. It will receive up to $7 billion in sanction relief in exchange. However, the deal will not begin until next year, when final details are hashed out. The White House has signaled in recent days that it is willing to let Iran keep portions of its controversial enrichment program under any final deal. Lawmakers maintain that only new sanctions on Iran will pressure it to make genuine concessions during future negotiations with the West. However, the White House has tried to stall a sanctions bill currently under consideration by the Senate. "If it hadn’t been for this agreement, the Senate would have passed the bill we worked on in the summer," Sherman said. Congressional insiders with knowledge of Senate deliberations on the bill say that the White House appears to be winning the battle. "It’s pretty clear that Democrats are under enormous pressure from the White House to slow roll negotiations with Republicans to run out the clock on the congressional calendar—and unfortunately, it's working," one senior congressional aide told the Washington Free Beacon. Republican House lawmakers struck a similar tone in comments to the Free Beacon, criticizing the nuclear accord as well as the White House’s efforts to sell a deal that they described as bunk. "The very definition of a bad deal is one in which Iran is not fully and unequivocally prevented from ultimately obtaining a nuclear weapons capability," Rep. Trent Franks (R., Ariz.) said in a statement provided to the Free Beacon. "And by Mr. Obama’s own admission, this plan does not entirely rule out such a scenario." "This accord amounts to Mr. Obama crossing his fingers and hoping that the world’s largest state sponsor of terrorism—which has sent hundreds of thousands of child soldiers to their deaths, has armed the militants killing Americans abroad, and has called for the destruction of both Israel and the United States—will behave reasonably," Franks said. History will not look kindly on Obama’s outreach to Tehran, Franks said. "Mr. Obama's political determination to make a deal with Iran at any cost, even if it endangers the peace and security of our closest allies as well as our children's future, will become apparent in the long run, and history will discover that the price the world may have to pay to deal with a nuclear-armed Iran in the future will far outweigh the price we could have paid to prevent the Islamic Republic of Iran from gaining nuclear weapons," he said. Rep. Ileana Ros-Lehtinen (R., Fla.), chair of the House’s Foreign Affairs Subcommittee on the Middle East and Asia, said that the administration has been played by Tehran. "The administration started these negotiations from a position of weakness and Tehran sensed that and took full advantage," Ros-Lehtinen said in a statement provided to the Free Beacon. "Now we are faced with a situation in which Iran is allowed to continue enriching uranium, it can continue constructing its heavy water reactor at Arak, and this deal doesn’t even address other key components of Iran’s nuclear weapons program—ballistic missiles and weaponization—which Iran continues to develop undeterred," she said. It is up to Congress to keep the pressure on Iran, Ros-Lehtinen said. "Congress must continue to enact and enforce sanctions on Iran until it halts all enrichment and takes verifiable steps to dismantle its entire weapons program," she said. Rep. Roskam said it is dangerous to believe that Iran can be trusted with any type of nuclear program. "There is no such thing as a peaceful, civilian Iranian nuclear ambition. It is an illusion, a manipulation and a deception," Roskam told the Free Beacon. "The Obama administration fails to grasp this critical point and is pushing the world toward a most grievous error." "The interim deal with the Iranian regime recognizes an Iranian right to enrich uranium and in doing so propels the regime toward its unambiguous goal of weaponization," he said. "Congress must be similarly unambiguous. No enrichment for Iran. Period." Rep. Michele Bachmann (R., Minn.) criticized the White House’s willingness to grant Iran uranium enrichment rights. "The whole ballgame is whether Iran has the right to enrich uranium, and any final deal must include Iran dismantling their nuclear weapons programs once and for all," Bachmann said in a statement provided to the Free Beacon. "Unless that happens, the United States should be increasing sanctions on Iran, not easing them and giving up any leverage we possess." Rep. Richard Hudson (R., N.C.), a member of the House Homeland Security Committee, said that neither Congress nor the American people support the "reckless" deal with Iran. "We must not give a dangerous regime with a penchant for terrorism and extremism the capability to build a weapon before the world can react," Hudson said in a statement provided to the Free Beacon. "Any nuclear deal must include swift and decisive action that forces Iran to completely abandon its crusade to acquire nuclear weapons or else we should continue to tighten sanctions on this bad actor." Other lawmakers said that Iran cannot even be trusted to adhere to any future deal. House Armed Services Committee (HASC) member Rep. Jackie Walorski (R., Ind.) argued that Iran's ongoing violation of United Nations resolution gives "the world reason to be skeptical about Iran’s commitment to complying with the interim agreement or with any future international accord." Like others, Rep. Rodney Davis (R., Ill.) said that only new sanctions will push Iran to make concessions "that would eliminate their enrichment capabilities." This entry was posted in National Security and tagged Barack Obama, Brad Sherman, Ileana Ros-Lehtinen, Iran, Nuclear Weapons, Peter Roskam, White House. Bookmark the permalink.